Please note: When Creative Coding Mode is activated only those top level codes will be displayed, that have a maximum of two subcode levels. All top level codes with more than two subcode levels are not available. Now, single codes can be dragged from the “Code System” onto the blank workspace on the right with the mouse. 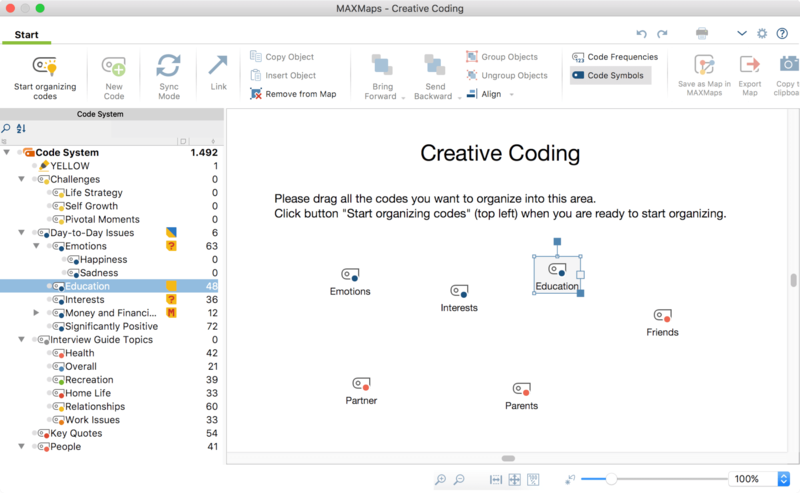 If you select a code with subcodes, MAXQDA will insert the subcodes automatically onto the workspace. You can select multiple separate codes by holding down the Alt key (Windows) or option key ⌥ (Mac) and then drag the selection onto the Creative Coding workspace while holding down the mouse button. To select a range of codes, first click on a code and then click on a second code while holding down the Shift key ⇧. This will also select all codes between the clicked codes. To search for a code in a potentially very long code system, you can click on the magnifying glass above the codes. There is also a sort icon to sort the codes within each hierarchy level by alphabet. To remove a code from the workspace, right-click the code and select Remove from map. After completing your selection, click the Start organizing codes symbol at the top left of the screen. 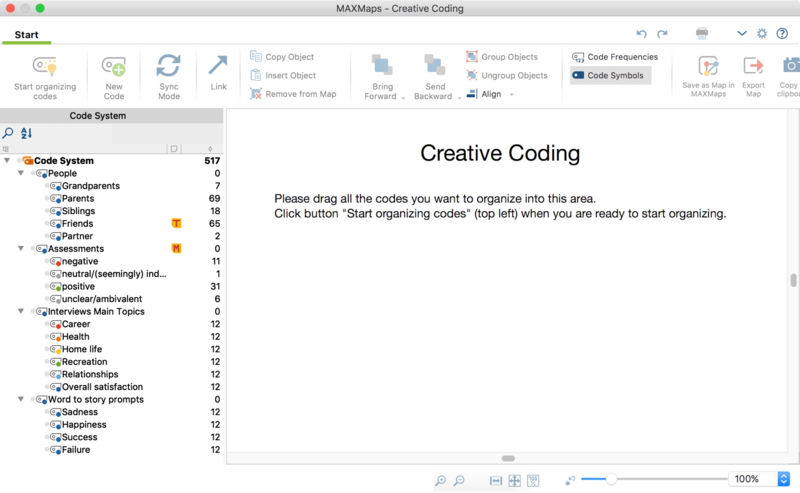 Please note: While MAXQDA’s Creative Coding Mode is activated, the MAXQDA application is blocked and no further changes can be made to the open project until Creative Coding is finished.